Calling all fans of the upcoming Marvel’s Avengers: Age of Ultron movie! 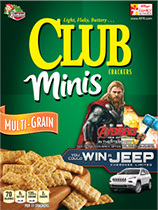 Kellogg’s just launched the Kellogg’s Snacks Avengers: Age Of Ultron Instant Win Game via the Family Rewards program at KFR.com/AvengersPrizes. Kellogg will be giving away $140,000 in prizes including 500 Marvel DVD sets, 2,000 Movie Tickets and the grand prize of a 2015 Jeep Cherokee Limited! Plus, look for codes found in specially marked packages of Kellogg’s Cereals and enter them at KFR.com/Avengers to earn e-movie cash good toward a movie tickets to see Marvel’s Avengers: Age Of Ultron! Alternatively, you may also request a free Code by sending a self-addressed, stamped envelope to: Kellogg’s Snacks AVENGERS: AGE OF ULTRON Instant Win Game, P.O. Box 7558, Kalamazoo, MI 49003-7558. 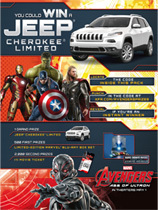 Once you obtained a Kellogg’s Family Rewards Code, visit KFR.com/AvengersPrizes to enter your code for a chance to instantly win a Jeep Cherokee Limited and other awesome Avengers prizes. Each KFR code is good for one (1) game play, limited to a maximum of twenty (20) game plays per day. All KFR codes must be submitted between 12:00:00 AM (ET) on Monday, March 2, 2015 and 11:59:59 PM (ET) on Monday, October 5, 2015. The Kellogg’s Snacks Avengers: AGE OF ULTRON Instant Win Game is open to legal residents of the fifty (50) United States and District of Columbia who are 18 years of age or older at time of entry. Must be a registered member of the Kellogg’s Family Rewards program.